Got a kick in the mojo since Wednesday – my beads finally arrived and so has spring. 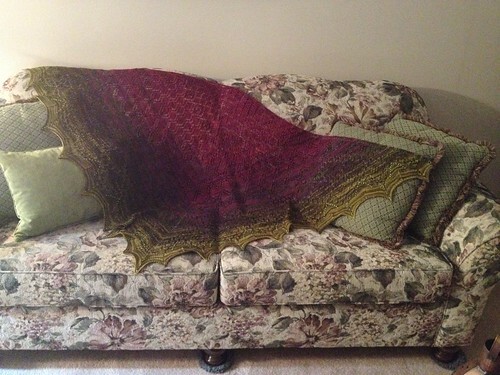 I finished up my fourth project for National Crochet Month, ‘Starry Skies Stained Glass‘ afghan. This cleared out the last of some ancient stash and some never-to-be-finished projects. I actually hooked from a half completed vest at one point! Very happy with the results and debating to gift this or keep for my Moroccan, boho family room. Time now to backtrack to my third project as the beads arrived late Friday afternoon. I think they’ll look pretty along the border. I chose Toho’s in ‘Metallic Cosmos’, 8/0’s to go with the Berroco Ultra Alpaca Fine in ‘Blueberry Mix’. That’s it for now! Hope Monday is gentle with you and don’t forget – to celebrate National Crochet Month, all yarn in my Etsy shop ships free to Canada and USA! She is off the hook and off the needles. 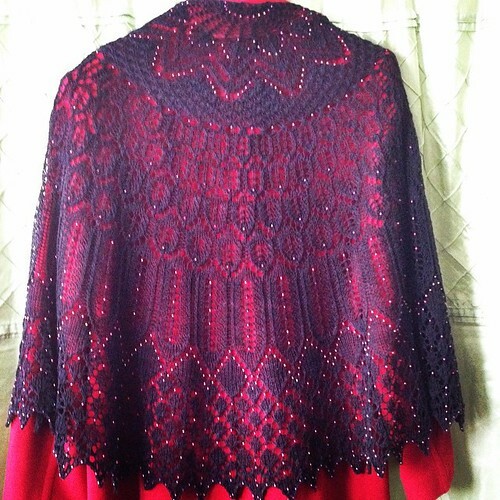 “Skellina” is a blingy version of “Yorick” and technically another test knit. Note to self: take notes, SMH. I believe I’ve got it all down now and will get at some writing and tech editing. This is another of my ©kindred knits & cohabiting crochet projects, combining filet mesh crochet in a motif form, with knitted lace work and ribbing. I invented a rib stitch to achieve the look of bones for Yorick… alas poor Karin! I knew notes not – apologies to Willy Shakespeare. All is recouped though and tweaked even, so that the Skellina version is “The One”. I was iffy about using a yarn with acrylic – I totally own being a yarn snob – but this King Cole “Galaxy” just wouldn’t stop following my around my LYS the last time I went for a Sit ‘N Knit. I figured anything so sassy and insistent needed WIP’ing into shape. I actually love it… it is the tiniest bit splitty but you’d expect that with the paillette thread and in no way is this a disadvantage. The yarn is soft and shows the stitches well. What I really like is that the paillettes shine with rainbow hues, when light hits them. It’s like a two for one look and gives a perfect sugarskull or Día de Muertos look to the finished cowl. The other WIP’s are coming along, that being a second “Filigree” and the resurrected third pair of “Goth-stonian” legwarmers. I found some beautiful Asian-motif beads in a lacquer red that’ll be perfect for this pair that I’m working in some black Cascade 220. And now, back to the grind. Cheers All! When did I turn into “The Blockinator”? So totally worth it to make the time. Ollie has come out huge and I’m glad, it gives the gradient colourway lots of room to be appreciated and look at all those nupps! Loved this project. Janine is a whiz with lace patterns and I am totally smitten with the Unique Sheep’s Luxe base. The beads are lit up with natural daylight. Their colour is a deep ruby – S/L ruby AB’s for my bead people. The Elle Rae yarn is a deep rich black that has a lovely sheen. 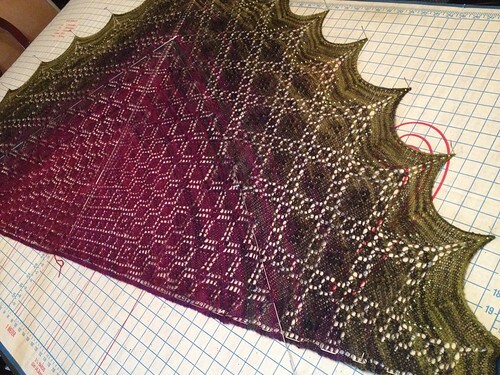 Love this project like crazy and I think I may have become a blocking convert!